You know, we've all had days like these. a quick run to the supermarket or gas station beckons so we run out of the house barefaced, oily skin and blemishes exposed, with an untidy ponytail and mismatched clothing to boot. we think to ourselves: who cares what other people think? it's just five minutes and no one even looks anyway. then we find ourselves wanting to shrink into nothingness when a perfectly coiffed, groomed and attired lady stands behind us at the checkout counter, smelling of roses and waiting to pay for her organic tea and plain yoghurt while we're lugging a huge basket of frito lays, instant noodles and a family-sized carton of ice cream. and if instead of the lady there had been a gorgeous man queueing behind us, we'd be feeling a lot more sorry for ourselves. change of topic but this is what alexander mcqueen came up with for new york fashion week recently. 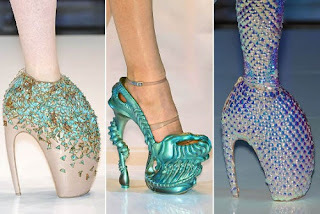 if not for the legs sticking out from those things i wouldnt have known they were shoes.